Baltimore Orioles third baseman Manny Machado was carted off the field with an apparent left knee injury after running through the first base bag awkwardly on Monday afternoon in a game against the Tampa Bay Rays. 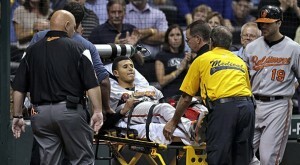 Machado spent several minutes on the field in obvious pain before being carted off by the Orioles training staff. In 155 games coming into Monday, Machado has hit .282/.313/.431 (99 OPS+) with 14 home runs and a league-leading 51 doubles. He also leads the league in at-bats (663) and plate appearances (706), another testament to his early-career durability. The Rays beat Machado’s Orioles, 5-4, and Baltimore’s hopes for the Wild Card are fading. Missing Machado for the rest of the season, as seems likely, make them appear a long-shot to catch the Rays and Rangers in the postseason hunt.